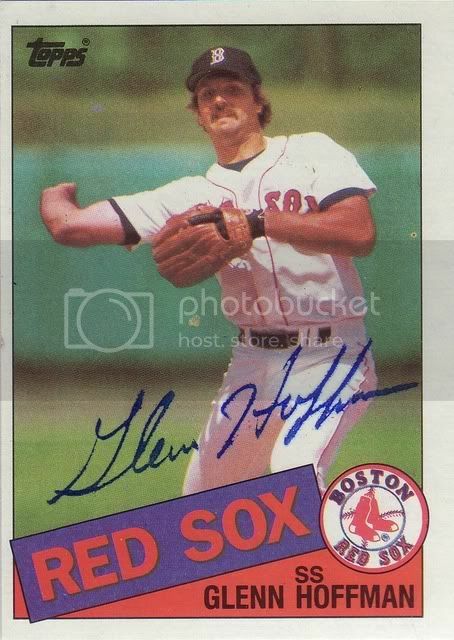 GlennHoffman is a shortstop/third base type who played for the Pawtucket Red Sox.... Gah! In 1978, 1979, 1987, and 1988. Hoffman played in four games in 1977, but we don't need to delve into that. 1978 was alright once you get past the pain. Hoffman was just a baby at 19 and he played in 131 games(!). He batted .282 with a .322 OBP. The next season, 1979, Hoffman was fourth in the International League for games played with 139. While most of his numbers increased only slightly, he hit 11 home runs... Nine more than he did the previous season. He was hit by a pitch ten times, placing him second in the league. Hoffman was really hitting his stride in the white hot spotlight. Fast forward to 1987! Glenn H. didn't do anything interesting during that period, anyway. I mean, hello, Van Hagar. Hoffman played in 46 Pawtucket games, mostly playing third. It wasn't that interesting. And then, at last, 1988. Glenn Hoffman is 29. A big 109 PawSox games. Hoffman walked A LOT! A lot for him, I mean. More than any other Pawtucket season. Also he mashed his K's down. Hoffman was well-seasoned by that point. 1. This story is pretty great. It's mostly about Trevor, but still. 2. "Pawtucket was a lot bigger city on the way up than on the way down." - Hoffman on movin' on up and slip slidin' away. Glenn Hoffman's in the lobby of the first base tower. Waiting for you. I'll be here tomorrow so please stand by.